From record-setting crowds at rallies and protests to futuristic swarms of robots, our world is currently experiencing a continuing rise of complex, distributed collections of independently acting entities. With potential applications such as computer graphics, predicting crowd disasters, improving robot cooperation, and enabling the next generation of air travel, developing models to reproduce, control, predict and understand these types of systems is becoming critically important. In this talk, I will give an overview of how to use velocity -space planning techniques to compute cooperative motion paths for a group of independent entities sharing the same physical space. Specific topics will include optimization based strategies for distributed collision avoidance, uses of the principle of least effort for simulating crowds , and data-driven strategies for modeling differences in personalities. The talk will also cover related techniques needed to achieve accurate simulations of largescale crowds such as efficient parallel/SIMD compute models and methods of validating simulations against real world data and will discuss how velocity-space motion planning can be applied to collision avoidance for distributed robotic systems. I will focus on the special case of simulating human-like crowds, with applications to computer animation, gaming, robotics, pedestrian dynamics, visual surveillance, and architectural analysis. Dinesh Manocha is currently the Phi Delta Theta/Mason Distinguished Professor of Computer Science at the University of North Carolina at Chapel Hill. He has co-authored than 400 papers in the leading conferences and journals on computer graphics, robotics, and scientific computing. He has also served program chair for many conferences and editorial boards of many leading journals. Some of the software systems related to collision detection, GPUbased algorithms and geometric computing developed by his group have been downloaded by more than 150,000 users and are widely used in the industry. Manocha has received awards including Alfred P. Sloan Fellowship, NSF Career Award, Office of Naval Research Young Investigator Award, and 12 best paper awards at the leading conferences. 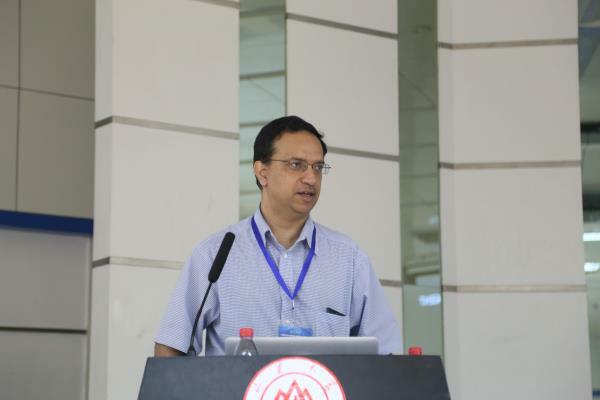 He is a Fellow of ACM, AAAS, and IEEE, and received Distinguished Alumni Award from Indian Institute of Technology, Delhi.